Miami city commissioners were impressed last week by details of the mass transit plan put into place for the Miami International Boat Show in February. Held on the same weekend as the Coconut Grove Arts Festival, critics predicted massive traffic jams and a potential cutting off of Key Biscayne from the mainland with the boat show traffic sharing Rickenbacker Causeway. 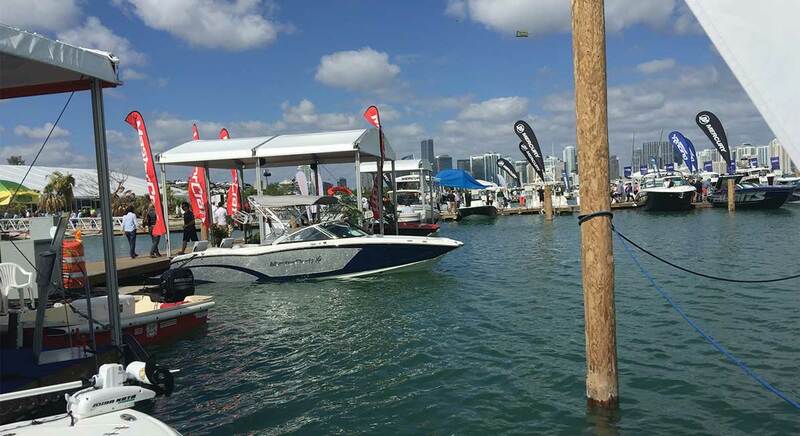 Boat show and Miami-Dade County officials said the roads saw a modest increase in motor vehicles but no major problems from the influx of thousands of visitors. The boat show’s Maintenance of Traffic Plan was reported as effective, ensuring that traffic to and from Key Biscayne flowed throughout the event via lanes designated for Key Biscayne traffic. Alice Bravo, director of Transportation and Public Works for the county, presented the city commission with a post-event report on traffic during the show. Miami Mayor Tomás Regalado had asked for the follow-up report. Highlights of the report included: The average travel time on the Rickenbacker Causeway was 6 minutes; average travel speed on the causeway was within the 40 mph range; and camera footage throughout the show showed Key Biscayne travel lanes and the entrance to the causeway had no delays. The boat show organizer, the National Marine Manufacturers Association, partnered with city and county police to handle the traffic. Partner agencies included the Miami Police Department, City of Miami Special Events, City of Miami Public Works, City of Miami Capital Improvement and Transportation, Miami Parking Authority, Miami-Dade County Public Works and Waste Management Department, Miami-Dade Transit, the Florida Department of Transportation, SunGuide, and the Miami-Dade Expressway Authority. More than 53,000 people were transported to the boat show’s new venue on Virginia Key by a fleet of water taxis, representing more than half of the 100,000-plus who attended the event, according to the association. Another large number of attendees was transported to and from the city-owned site around Marine Stadium on shuttle buses. More than 78,000 people were transported by shuttle bus to the show site from downtown. He said the success of alternate forms of transportation illustrated that “we can change the culture of using our cars” to get everywhere. Mr. Carollo said he traveled on that Saturday afternoon to the boat show and saw no problems with traffic. “There was no backup,” he said. He’s attended the boat show for years, he said, when it was held primarily inside the Miami Beach Convention Center. Mr. Carollo praised the new event space on the water and land surrounding Miami Marine Stadium for being more conducive to a marine-related event. “It felt like a boat show,” he said. •Free shuttle bus from Metrorail stations, hotels and park-and-ride locations. •Free water taxis from Brickell, Coconut Grove, Downtown and Miami Beach. •Coordinated Metrorail and Metrobus prepaid 1-Day passes. •Temporary relocation of bus stop locations. •Freebies in-town travel in Brickell, Coconut Grove and Downtown. •Special event traffic signal control. •Variable message signs directing traffic. •Dynamic message signs alerting of congestion. •Police presence at all intersections. •Pedestrian fence along the beach side to avoid pedestrian crossing at undesignated areas. •Operation of a central control center for the event. •Restricted parking locations at the location. •Park-and-ride locations within the city with free shuttle service. Officials used traffic cameras, high-tech monitoring devices and on-the-street observations in adjusting law enforcement personnel to various locations and duties with the goal of keeping traffic moving. Tracking devices were placed at South Bayshore Drive and 26th Road, and the traffic signal at the entrance of Mast Academy. Commissioner Francis Suarez said he would echo the praise from Mr. Carollo. The association invested more than $800,000 in the comprehensive traffic plan, focusing a large part of the plan on the park-and-ride model, which proved effective with an estimated 80% of boat show attendees parking at designated offsite locations and arriving via shuttle bus or water taxi. The county study found there was an average of 5,000 additional cars on the Rickenbacker Causeway each day of the event compared to the same period in 2015, a figure that parallels the estimated 4,000 pre-paid boat show parking spaces that were available on Virginia Key and shuttle traffic. Ms. Bravo was joined by Cathy Rick-Joule, boat show director. “We demonstrated that you can move a lot of people using mass transit,” Ms. Rick-Joule said. While long waits were reported for some water taxis and shuttle buses, improvements were made each day to keep them moving more smoothly and the boat show organizers say they will be making additional improvements for the 2017 show to eliminate long waits. “We were excited to see so much enthusiasm for the park-and-ride service, especially for water taxis. We know that in many cases, attendees waiting for a water taxi were offered shuttle bus rides but were willing to wait to be able to arrive to the show by water,” Ms. Rick-Joule said. Don’t fool yourself–If you drive to take an event shuttle, that’s NOT taking mass transit.